After lunch there were breakout sessions. I picked the Automotive track, the theme of which was again “lifelike experience”. 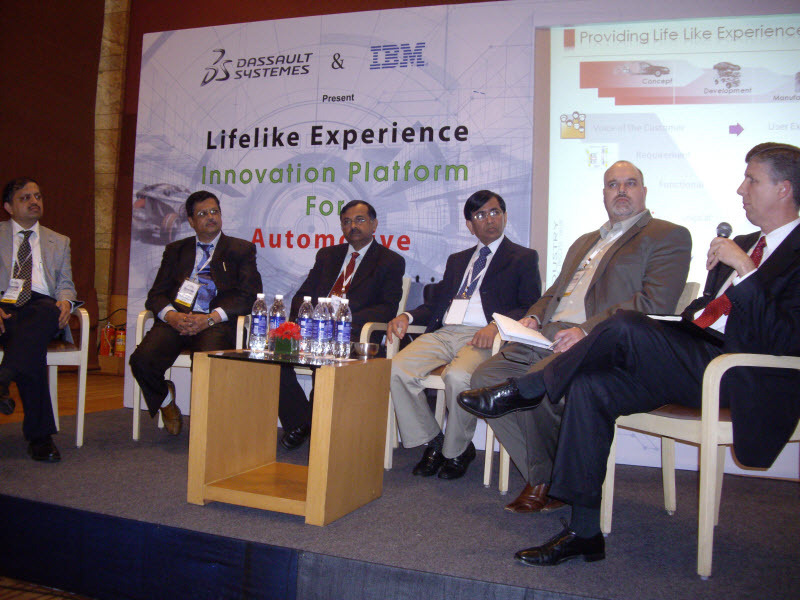 There was an hour long panel discussion, the panel consisting of eminent people from the auto industry, Indian and foreign. The Indian auto industry is going through the roof. Suppliers are not being able to supply adequate number of parts to OEM’s. One question was whether all was well under the hood and whether this astronomical growth was sustainable.The consensus among the panelists was that the growth that we are now seeing is the pent up demand showing itself. That being said, everyone expected the growth to contain although the numbers would go down to more reasonable levels as time progressed. One of the panelists from Detroit was of the opinion that India is in quite an enviable position. Another question was whether OEM’s were looking to take back some of the engineering back in house from Tier 1 suppliers. One panelist replied in the negative saying that OEM’s were constrained by their own resources. Another panelist gave the example of Toyota and how they had very tightly integrated their suppliers into their environment and hence the need for taking back engineering was simply not there. Collaboration was the key. A followup question was who takes the lead in innovation: the OEM or the suppliers or legislation. The moderator added asking whether the customer was involved in innovation at all. One panelist replied that the person who instigates innovation almost always was the one who is the sufferer in the situation. Another was of the opinion that the customer should trigger innovation. A third panelist said that it largely depended on the nature of the relationship between the OEM and their supplier. A member of the audience asked the panelists about the scarcity of skilled manpower in India for product design and development. The person wondered whether the hype created by the IT industry in India was responsible for it. None of the panelists really answered that question, but one did quote a recent study suggesting that only 10% of the 400,000 engineers graduating in India are employable in product design and development. Another panelist drew a distinction between teaching a person how to use a tool and showing him how he can innovate with that tool. Another question was, as a country, should India be the focussed on innovation only in terms of coming up with low cost products and processes. One panelist was of the opinion that low cost was normally a part of every innovative product or process. Someone in the audience who called himself an innovation consultant questioned how we could create a culture that fostered innovation. One panelist was of the opinion that availability of technology was a key factor in creating an environment that fostered innovation. Another said that the people entrusted with the job of innovation should not be constrained. Another said that the culture change needs to happen at the top before it can trickle down to the people who actually do the innovation. Disclosure: Dassault Systemes paid for my airfare, airport transfers and hotel.